A smooth mushroom soup served with a chestnut cream and a poached egg. Peel and finely dice the shallot. Peel the pumpkin and scoop out the seeds in the centre. Cut the flesh into 2cm dice. Heat a saucepan and add a little olive oil. Sweat the shallot with the salt, butter and bouquet garni for 3 minutes. Add the pumpkin and sweat for 5 minutes, stirring often. Add the cream and the milk and cook for 20 minutes. Check that the pumpkin is soft and then remove the bouquet garni. Blend to a smooth soup and keep warm until ready to serve. Melt the butter in a saucepan and then sweat the shallot with the salt for 3 minutes. Add the chestnut, cream and stock and cook for 10 minutes over a medium heat. Blend with a stick blender and then pass through a fine sieve. Check the seasoning and keep warm. Bring the water to a gentle simmer and add the vinegar and the salt. Break each of the eggs into their own ramekin. Stir the water to create a whirlpool effect and then add the eggs to the water. Cook for 2 minutes and then drain on kitchen paper. Trim the egg white to give a neat shape. 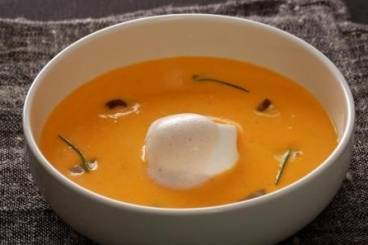 To serve: pour the pumpkin soup into bowls and delicately place a poached egg on top. Use the stick blender to foam the chestnut cream, tilt the pan and then spoon the foam on top of the eggs. Finish with a sprinkling of chopped chesnuts and a few drops of the emulsion.